This Aurora HDR 2017 review has been a little long in the making because although this program has been designed to be simple to get started with, some of its more technical features are quite deep. Indeed, HDR (high dynamic range) photography is difficult to get right. There’s the technical aspect, capturing a wide enough brightness range in a single image or a series of bracketed exposures, and there’s the aesthetic side – turning them into an image that’s dramatic and beautiful rather than an overcooked dog’s dinner. Sometimes they’re not too far apart. The first part is easy. You can sometimes get away with a single image shot in RAW with some careful exposure technique. Otherwise, you can use your camera’s auto-bracketing function to capture a series of three, five or even seven images a couple of stops (2EV) apart in exposure, then merge them in a dedicated HDR application like Aurora HDR 2017. 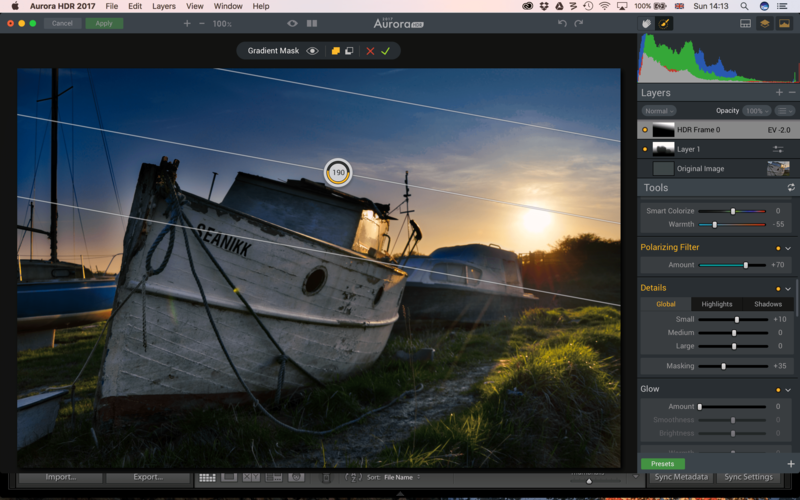 It’s a Mac-only program developed by US company MacPhun and it’s a major update of its first release, Aurora HDR Pro. Both have been produced in conjunction with celebrated HDR expert Trey Ratcliff, who’s supplied technical expertise, video tutorials and presets for this release. Aurora HDR 2017 can be used in one of two ways – as a standalone application working directly with single images or bracketed exposure series, RAW files or JPEGs, and as a plug-in for Photoshop, Elements, Lightroom and Aperture. If you launch Aurora HDR 2017 as a standalone app, this is what you’ll see. There’s no built-in browser so you have to find your files manually. If you use it as a standalone application it launches with a pretty plain and simple ‘Load Image’ window and you have to navigate to the folder where your pictures are stored before dragging them on to this window. 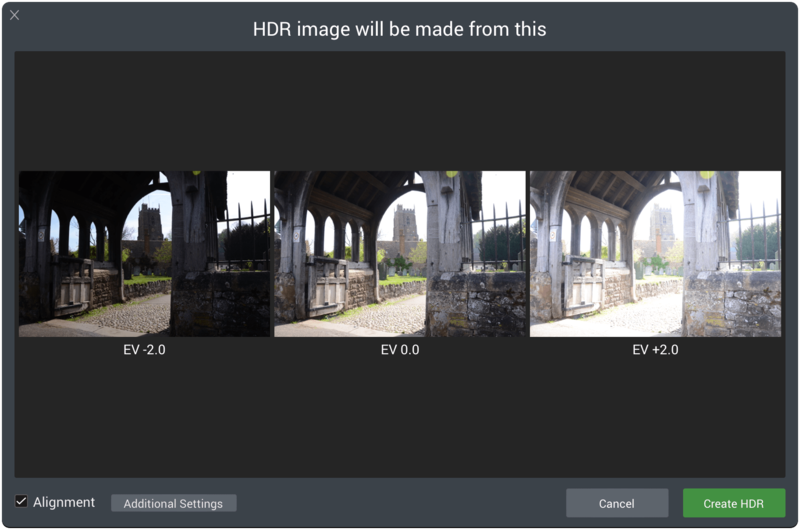 Aurora HDR 2017 adds a new feature, however – batch processing. Here, you can select a folder full of images and the software will automatically group them into bracketed sets. You can then process all these images automatically using a chosen preset. 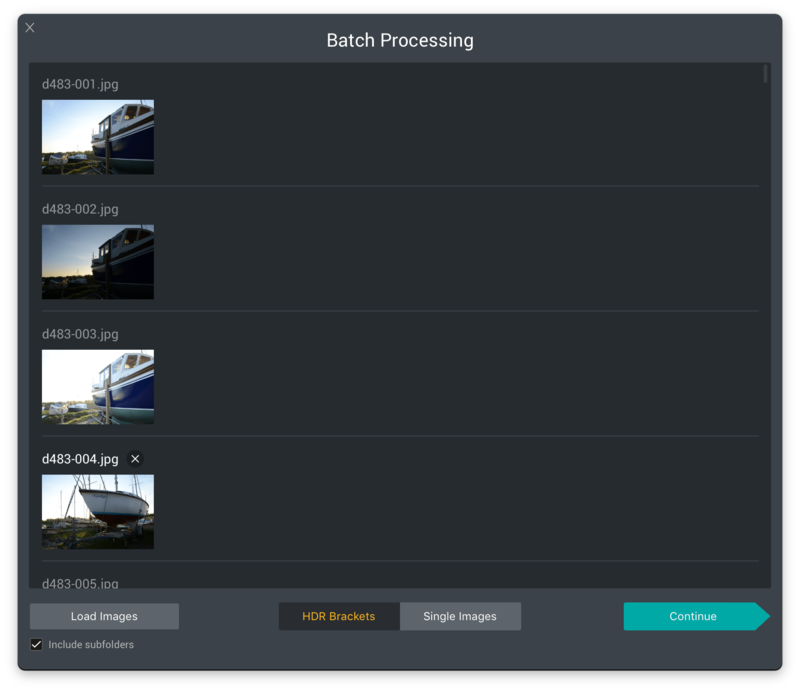 The new Batch Processing window should stack your bracketed exposure series automatically. For some reason it would do that with mine. Well, that’s the theory. For some reason, it wasn’t able to group the bracketed series’ in my test image folder, even though they were taken close together in continuous shooting mode, so I couldn’t really test this out. Besides, you’d have to be pretty confident in the presets to take this approach and, intially at least, you’d probably want to adjust your HDR images individually. I found it easier to use Aurora HDR 2017 as a Lightroom plug-in, and the neat angle here is that you can opt to send it the original images or Lightroom edited TIFFs. So if you shot RAW files, you can bypass Lightroom’s own RAW conversion or, if you’ve done some image optimising, distortion or perspective correction in Lightroom, you can send edited, prepared images instead. It’s easier to use Aurora HDR 2017 from a host application like Lightroom. This means you can use lens distortion and perspective correction tools first. When you open a bracketed exposure series, Aurora HDR 2017 shows you the images which are going to be merged and offers an ‘Alignment’ checkbox. If you used a tripod, you may not need this, but if you shoot handheld (which I do mostly), this will take care of any misalignment between frames. There’s an ‘Additional Settings’ button too. You click this to access further options including chromatic aberration removal (highly recommended, since HDR processes really exaggerate any colour fringing), ghost reduction and raw noise reduction. Aurora HDR 2017 can align handheld HDR brackets – just remember to check the Alignment box, bottom left. 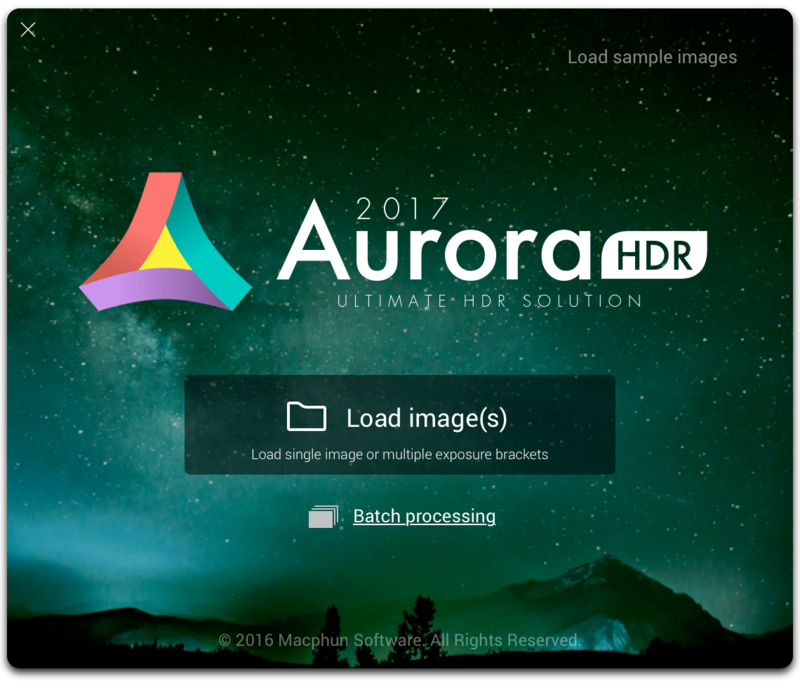 Aurora HDR 2017 can correct chromatic aberration, ghosting and even noise during the merging process. The ghost reduction is useful if you have pedestrians moving through the scene as you photograph it or leaves moving in the foreground, which is a common issue with landscapes on a breezy day. It works well. I have a couple of bracketed sets where the leaf movement is too much and some ‘ghost’ leaf edges are left behind, but its nothing that a bit of quick cloning couldn’t sort out and most of my series merged really well. The raw noise reduction could prove useful later on because some HDR adjustments really exaggerate noise, and although there are some good noise reduction tools that can be applied later, it makes sense to reduce noise as far as possible right at the start. If you’re opening a single image you don’t get these various merging choices. 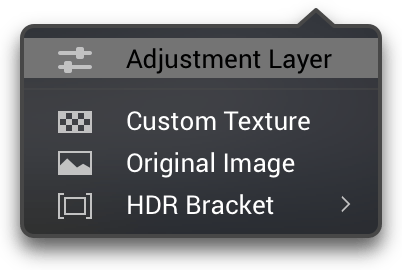 You simply hit the ‘Create HDR’ button to open it in the main Aurora HDR 2017 interface. This is where you’ll find most of the new tools – MacPhun says there are 20 major improvements and 10 new features, including a new ‘HDR Look’ slider. This controls that characteristic HDR ‘exaggerated edges’ look, which is OK in moderation, and sometimes a necessary part of the overall effect. But being able to tone it down or even remove it altogether is a great feature because it means you can generate truly natural looking images when you need to. But this option is missing when you work with single images, not because you actually need it, because it’s clear that Aurora HDR 2017 handles these in a different way. When you open a single image you don’t get the full tone mapping effect of merged exposures and it’s more like working on a regular photo. You can get nice looking ‘HDR’ effects from single exposures, but you have to work at it a little more with the program’s regular image adjustments, layers and masking tools. Aurora HDR 2017’s best results will come from bracketed exposure series, not single images. Top tip: You can trick Aurora HDR 2017 into correctly tone mapping a single image by preparing three different exposures from a single RAW file in Lightroom as virtual copies and then sending all three to Aurora HDR as if they were part of a bracketed series. You can trick Aurora HDR 2017 into tone mapping single images if you first save them out with three different exposure adjustments. HDR merging can be time-consuming work. MacPhun says this new version is 50% faster than the old one, but on my MacBook Pro it still takes around 25 seconds to merge a three-shot exposure series and a similar time to save out an edited version when it’s finished. Each adjustment you make also brings a small delay as the software re-renders the image, though this typically takes only a second or so. This isn’t unusual. HDR apps typically work in an extended 32-bit colour space which places pretty heavy demands on the hardware. Aurora HDR 2017 feels no worse than most and better than many on my particular Mac – it’s just a reminder that HDR editing is not a split-second fix but a comparatively hardware- and labour-intensive process. The Aurora HDR 2017 interface is pretty simple. The main window shows the image you’re working on, there’s a vertical ‘stack’ of tools panels oin the right and along the bottom is a strip of preset HDR effects. You can just click an effect to apply it, and each one is made up of a combination of different tool settings, so you can check to see how they’re done, make modifications where necessary and design your own effects. The presets supplied include some interesting variations like this one, but could do with more. The presets are organised into categories including Basic, Realistic HDR, Landscape, Dramatic, Indoor and Architecture. MacPhun also has free presets from Trey Ratcliff himself and photographers Captain Kimo and Serge Ramelli with the option, no doubt, to add a lot more in the future. I mentioned in my earlier review of Aurora HDR Pro that these lacked a little visual variety, and I still think so. The strength of this program is the quality of the results it can deliver but the presets don’t have enough variety and drama to sell it. If you look at those that come with Google’s HDR Efex Pro you’ll see the difference – you might use some of those Google presets once in a blue moon, but the imagination, drama and variety convince you that there is something special here to explore. If you look at the Basic category in Aurora HDR 2017, however, you’ll just see a bunch of not terrible different images with the same colour palette and varying degrees of ‘HDR-ness’. Most of the other categories are the same, and only the Dramatic tab offers any real variety. The Trey Ratcliff presets are interesting, if a little wild, and the whole presets collection veers towards the kind of HDR over-the-top-ness that this software is actually so good at avoiding. That’s enough about the presets. I do think MacPhun needs to take another look at these as they are the shop window for the software, but let’s move on to the tools themselves and the results they can deliver. Right at the top of the tools panel is the HDR Tone Mapping section. If you’ve merged a set of bracketed exposures you can drag the new HDR Look slider right back to zero to create as natural a look as you’ll ever see from an HDR application. Apart, perhaps, from the odd faint ‘glow’ around a dark object against a midtone background, there’s almost nothing to indicate it’s a merged HDR composite at all. This alone is one of Aurora HDR 2017’s crowning achievements, and if you feel the result is just a little flat in the midtones or needs a little ‘punch’, there’s plenty you can do with the other tools to put that right. You don’t have to create your HDR effects from scratch. You can start with a preset from one of several different categories and then use the manual tools to adapt it to your taste. Below this is a Color panel for adjusting overall white balance (Temperature and Tint) and Saturation, Vibrance and Color Contrast. The Color Contrast effect looks a lot like a general saturation increase at first glance, but no doubt there’s more to it than that. Next up is the Structure panel, with a slider for overall Clarity and sections for HDR Structure and HDR Detail. That’s three different ways of giving your HDR images some visual punch, working on three different levels of detail. Then there’s the HDR Denoise panel. It might not look as if your image has much noise to start with, but once you start experimenting with the different controls, it can quickly build up, and it’s most obvious in areas of even tone, like skies. There’s an Amount slider here, plus Smooth, Super Smooth and Opacity sliders. Heavy manipulation can introduce quite coarse, granular noise, though not in all areas. The built-in noise reduction tools work well, however. The Radiance tool adds a rich glow to your images with controls for warmth and saturation too. Below this is the Image Radiance panel. I’m not sure what the technical explanation is for this, but I’d describe it as a kind of diffuse dark glow that doesn’t look much on its own but, when it’s accompanied by some tweaks to the panel’s Smoothness, Brightness, Smart Colorize and Warmth sliders, it can add a rich, dreamy atmosphere to an otherwise ordinary image. You don’t have to use all these tools, by the way – in fact you don’t even have to see them. Each panel’s title bar has a rotating arrow gadget at the far right end for collapsing and expanding the panel. 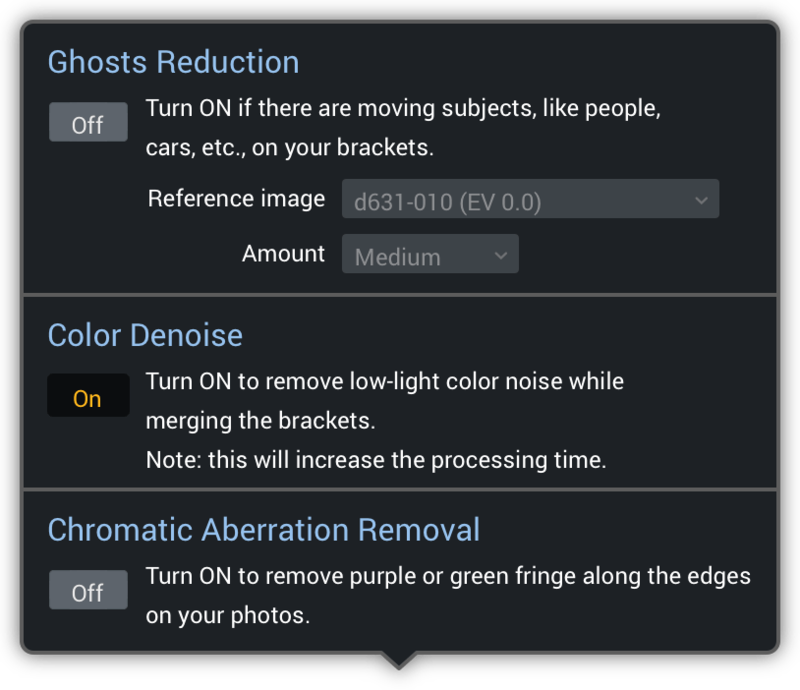 In addition, if you realise your adjustments have gone off course, each panel has a reset button, and if you want to check the adjustments are actually making a difference, there’s also a little amber show/hide button. Next, there’s Aurora HDR 2017’s new Polarizing Filter. This is meant to simulate the effect of a real polarizing filter, darkening blue skies (easy enough to do with software), intensifying colours (that too) and removing glare (technically not possible). It’s a nice idea, but it produced some horrible posterisation in sky tones when I used it on bracketed JPEG images, so maybe it’s best to use this on RAW brackets only. The Details panel offers control over Small, Medium and Large details both globally and individually for the Highlights and Shadows. So how does this tie in with the Structure panel? If it helps, think of these as small-scale sharpening adjustments rather than part of the HDR effect. You can sharpen up fine details with the Detail tab. This is different to the Clarity and Structure tools. After this is is the Glow panel, which adds a soft and spreading ethereal brightness to highlight areas. It’s a nice look for a certain sort of photo, but you need to make sure you don’t blot out the brighter areas that you worked so hard to capture with your HDR bracketing. The Top and Bottom Adjustment panel effectively applies a graduated filter effect. The upper and lower parts both have adjustments for Exposure, Contrast, Vibrance and Warmth, and there’s an Orientation section for adjsting the height of the graduation in the frame, the blend width and the angle. Below this is a Tone Curve panel for regular curves adjustments – you can adjust all three RGB channels together or the red, green and blue channels individually – and underneath that is an HSL panel for Hue, Saturation and Luminance adjustments. You can apply adjustments to the merged image directly, or use layers and masks to apply effects more selectively. We’re getting into the home stretch now. There is a Color Toning panel for applying a split tone effect to the picture, offering preset colour combinations or manual control over the shadow and highlight tints, and below this a Vignette panel with sliders for the vignette Amount, Size, Roundness, Feather and Inner Light. Both of these are straightforward to understand and use. Finally, there is the Layer panel. Oh yes, Aurora HDR 2017 supports layers, or at least adjustment layers. You don’t have to apply its tools to images globally to the entire image. Instead, you can create separate adjustment layers, each with its own layer mask, blend mode, source or texture map. The layers tools give Aurora HDR 2017 a further layer (sorry) of depth. Although the Layer panel is at the bottom of the tools stack, you add and view layers right at the top, directly below the image histogram. Each layer can have its own layer mask and there are three ways of creating these. You can use a simple manual Brush tool, with settings for size, hardness and opacity, a linear Gradient Mask, a new Radial Gradient Mask tool or another new option – Luminosity Masking. This splits the image up into eleven different brightness zones, just like the Zone System developed by Ansel Adams, and enables you to make a mask based on brightness zones. This could be useful if you are still left with areas of bright sky or dark shadow that you need to treat separately to the rest, for example. Aurora HDR 2017 supports layers, including adjustment layers, texture layers (which I haven’t explored yet) and the ability to merge in individual images from your bracketed exposure series. The layering and masking tools are straightforward to use and very effective. It’s easy enough to darken a sky with an adjustment layer and a linear gradient mask and then use the brush tool to remove the effect from tall buildings or other objects jutting up into the sky. The luminosity masking is slower – it takes a few moments for Aurora HDR 2017 to calculate the mask – but that could prove useful too. This image has two additional layers – one using the new Luminosity Mask feature to select and adjust the sky and another to blend in one of the original bracketed shots. I haven’t looked any deeper into the Texture Map option, but the Source drop-down in the Layer panel is interesting because it enables you to use one of the original bracketed exposures for the new layer rather than the merged image. It probably sounds as if I’ve found fault with quite a few things in Aurora HDR 2017, but actually these are all minor niggles because this is by far the best HDR tool I’ve yet found. I like the range of presets in Google HDR Efex Pro, but the tools themselves are in many places unfathomable and the results are nowhere near as good as this. In fact I’ve not found any other program that can deliver results as natural, as dramatic or as rich and colourful as those made possible by Aurora HDR 2017. Here’s a basic HDR merge with a dose of added contrast. You can use HDR for black and white too, where a good slug of the Clarity slider does this image no harm at all. I’ve finished off with a Radial Gradient mask on an adjustment layer, knocking back the brightness and adding some Radiance. HDR processing is a matter of taste, of course, and it’s as easy to produce over-saturated, over-processed eyesores with Aurora HDR 2017 as it is with any other HDR tool. But there is the scope here to produce real depth, elegance, subtlety and spectacle without all the usual HDR artefacts of glowing edges, noise and cartoon-like rendering. Currently on sale for £69 (sorry, my browser won’t let me check the US$ price), Aurora HDR 2017 is cheap enough, but still a significant investment given that HDR merging is increasingly common as part of larger applications like Serif Affinity Photo 1.5, for example . But here it’s done so well, and with so much control, that surely it’s worth the money to anyone bitten by the HDR bug – you can try out the Aurora HDR 2017 trial version if you’re not sure. There are lots of ways to do HDR badly, but there are very few tools that can genuinely do it well, and this is one of them. But have found quite a lot of blog and YouTube comments about Aurora slow processing of raw as opposed to jpg files, poor Macphun support response and dislike of the Trey Radcliff’s tendency to overcooked HDR effects. So although I was looking forward to trying this in a Windows version (whenever that will be available …….. ) maybe not yet time to pay more money for yet another software tool. Still discovering good things in DxO OpticsPro v11 and Capture One v10 which add to my old long term use of Photomatix Pro. Using Affinity a bit – looks like it has no real fine tuning of either ghosting or tonemapping and tends to fail on challenging highlight recovery which is disappointing. Grass needs cutting – not enough hours in the day to play with everything ……….. but ON1 RAW should be available in an hour or so – feel a coffee break coming on ! I have just gotten into photography…recently, I purchased Luminar and now I have been giving a very inexpensive rate for Aurora HDR 2017. Are both softwares necessary? What’s the major difference? 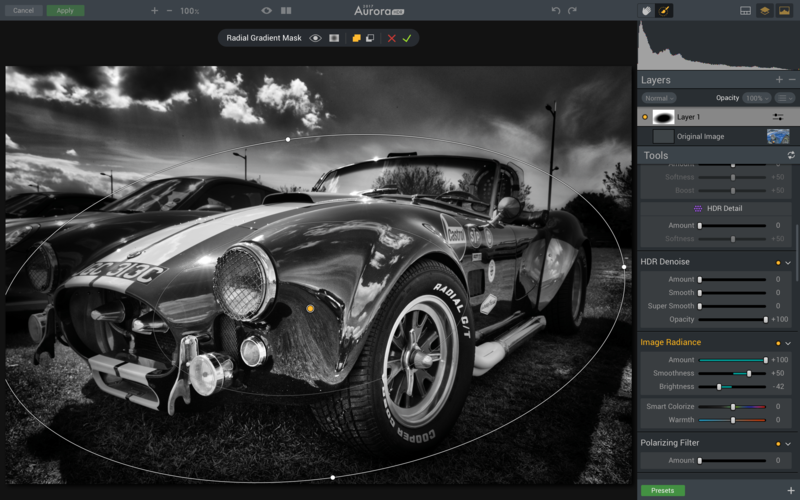 Luminar is a general-purpose photo-editor suitable for many kinds of photography. 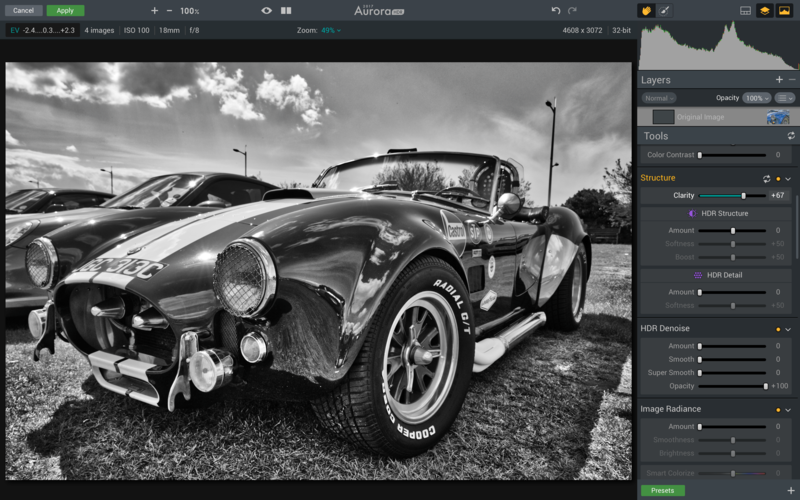 Aurora HDR is a program for the very specialised field of high dynamic range photography.